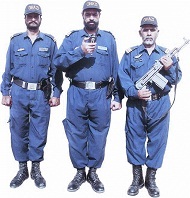 Guard Security Services (Pvt) Ltd is one of the leading Company of M.H Dadabhoy Group of Companies. For over a decade besides providing security services to M.H Dadabhoy Group of Companies enjoys vast clientele of Multinational & Local companies. Currently with over 200 employees as guard, the company in near future also intends to expand into providing armored vehicles to its VIP clients.